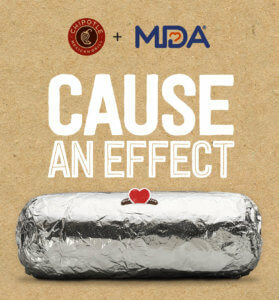 Burrito devotees, take note: This week, feeding your cravings fuels research and support services for MDA families, too. On March 16, select Chipotle locations around the country will donate 50 percent of the day’s proceeds to MDA. Just visit any Chipotle in San Diego, Los Angeles, Orange County or San Bernardino in California, or locations in Connecticut, Delaware, Indiana, Kentucky, Maine, Maryland, Massachusetts, Michigan, New Hampshire, New Jersey, New York, North Carolina, Ohio, Pennsylvania, Rhode Island, Virginia, Vermont, West Virginia and Washington, D.C. Once you place your order, mention MDA to your cashier or show them one of our blog or social posts about this partnership and your purchase will count toward the fundraiser! All in-store purchases, with the exception of those made with gift cards, are eligible, so grab your friends and family and head on over — your good taste will do serious good!